With the potential to make its way to Broadway, "Love Songs: A Musical" is Steven Cagan's new musical in development, written and composed by Steven, directed by Lynne Taylor-Corbett, and musical direction by Gerald Sternbach. On Tuesday, August 28, 2012, I was fortunate enough to see an hour-long version of this new work and I'm sure glad I did. Starring Tony Award winner Debbie Gravitte ("Jerome Robbins' Broadway"), Drama Desk Nominee Bryce Ryness ("Hair"), Kevin Spirtas ("Dr. Craig Wesley" on "Days of Our Lives"), Fleur Phillips, Ken Clark, and Ashley Kate Adams, "Love Songs" tells the story of a wedding weekend at the Loews Regency Hotel with the groom stuck out of town, the bride discovers she's pregnant, and two other couples, both in the wedding party, appear to be mismatched and ill-fated. What ensues is an evening of laughter, fun, and figuring things out. Cast of "Love Songs", Photo Credit: Jim BrammerSteven assembled a terrific cast of actors whose vocals blended together wonderfully and on-stage chemistry sizzled! It was great to see Debbie on stage and I hope this is the show that brings her back to Broadway! She has such power in her voice that is always a delight to hear! I had never heard Kevin sing prior to this show and let me say, he's got it! He has a wide vocal quality that puts him in my category of performers I go see even if they sang the phone book. Bryce is always a delight to see, he has a terrific singing voice in addition to his fine acting skills! He really knows how to use his voice to get that perfect feeling out to the audience. As for Fleur, Ken, and Ashley, this was my first introduction to them, and I must say, I'm a fan! The vocal range of Fleur and Ashley were out of this world! I was amazed at the high notes they could hit. Ken was able to stand his own and delighted me with his talent. Adam Rothenberg and Kevin SpirtasSteven has written some fantastic songs. He knows how to use a lyric to tell a story. My favorite numbers were "Lo & Behold," "Love Me," "I Am In Love With You," "I'm Rose," "Pitter Patter," "Carpe Diem," "Without You," "Sweet Tomorrow," "So It Seemed," and "Always and Forever." I thought "Lo & Behold" and "Always and Forever" were great ways to open and close the show. They featured the whole cast and were uplifting songs. I loved "I'm Rose" because Debbie Gravitte got to really show her stuff. To me, "Pitter Patter," is a tribute to one of our greatest composers/lyricists of our time, Mr. Stephen Sondheim and Bryce nailed it, proving yet once again, the amazing talent that is Bryce Ryness. I loved Kevin's voice on "Carpe Diem," just one of the songs that got to showcase his great voice. This presentation of "Love Songs" was only an hour. The complete show is done in two acts. It would be interesting to see the full two acts. While most of the story was told with in this hour production, I definitely thought there were some pieces missing, but this shorter version works. I am also intrigued to hear the songs that were left out. This version did contain a lot of ballads with a few upbeat numbers mixed in. I would like to see a few more upbeat songs in it only because there were a few moments my mind wandered with so many ballads. 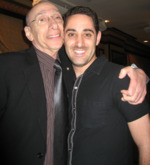 Steven Cagan and Adam RothenbergI have to say, Steven definitely has something special on his hands with "Love Songs." Overall, I had a great time and this hour long version did leave my mouth watering for more. I do hope this show has more of a life because Broadway can always use a show that makes people feel good and that is what "Love Songs" does. With just one performance left, "Love Songs: A Musical" plays at Feinstein's at Loews Regency (540 Park Avenue at 61st Street) through August 30th! Click here for tickets! 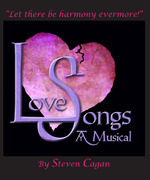 For more on "Love Songs: A Musical" visit http://www.lovesongs-amusical.com and follow the show on Facebook!